It’s a fact that each person is likely to have a worldview and a life experience that differs from others. We don’t always think alike. This is the reason that it’s often difficult for people to empathize with individuals who may not act, look, or dress similar to themselves. Empathy differs from sympathy. Sympathy is feeling compassion for a person. Empathy is deeper. It signifies a deep connection with the soul of another person. If I empathize with someone that’s hurting, I not only care about them, I am able to feel what they feel. I relate to them in every way possible, most likely because I have been in the same situation. I have been there, done that. On the other hand, if I have no shared experience or feeling with a sorrowing person, I might not communicate a true emotional connection. I have a friend who has been healthy and athletic his whole life. He has never related to my medical limitations. He is impatient with people who may be unable or unwilling to participate in sports. A lady suggested that my husband and I plan an adventurous outing for our wedding anniversary. She doesn’t understand that we are unable to take any day trips right now due to my husband’s fatigue and my chronic medical concerns. A friend of mine is recently unemployed. She has a checkered employment history due to certain medical and personal limitations. A successful relative of hers cannot comprehend why she has a hard time remaining employed for extended periods. I know a young lady who is uncomfortable talking to a young man that she knows because he lives a traditional lifestyle and he seems to judge her free-wheeling way of life. He attends a conservative church regularly. She wants to follow her own routine. I have a friend of many decades who comes from a traumatic past that has scarred her life. She is socially awkward in certain situations. She often causes confusion and drama when she interacts with others because they don’t understand her motivation, or reaction. Before we judge other people, we should ask ourselves if we really understand the cause of their behavior. We should try walking in their shoes, as the saying goes. None of us are perfect. We’re all in various stages of hurt and healing, so who are we to judge? When was the last time that you felt a true emotional connection with someone? 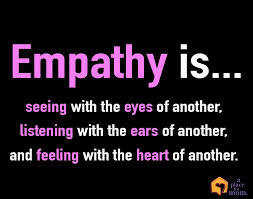 Being able to empathize is an important value.. Sometimes it helps personality development.. wonderful write up! Thanks! Empathy is part of every well-rounded personality. We often undervalue it, though. Judging others is a very hard thing to avoid. It is so deep in our behavior, but still we can teach ourselves to question our first impressions. Great post, thanks for sharing. Thanks so much! That's a brilliant observation you made: if we cannot avoid judging altogether, we can teach ourselves to question our first judgment...Okay! That's going to be a future blog post. What a great post! It is hard sometimes to deal with people who want us to "just get over it". Wonderful examples! Thanks, Mary. Everybody's brains are wired differently. Some people aren't built to "get over it" quickly; they just can't. Other people need to accept that. I take a long time to get over everything.